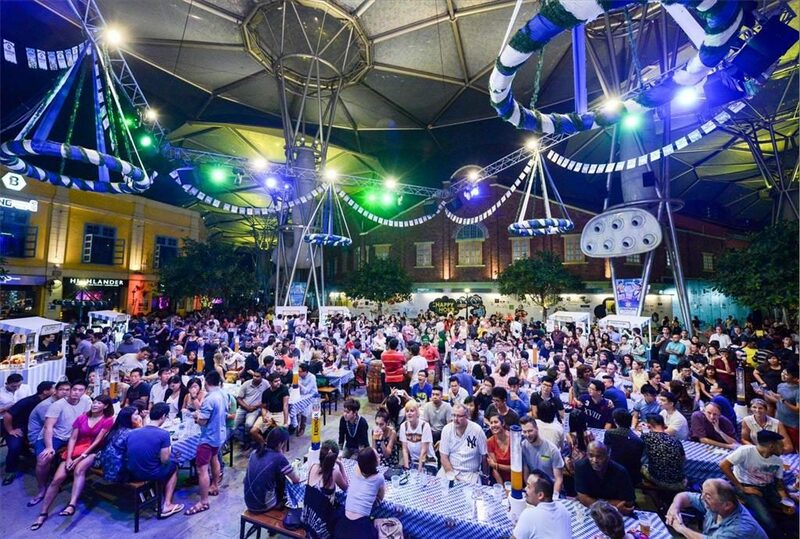 Top 10 Places In Singapore To Celebrate Oktoberfest 2016! Get Your Beer On With These Top 10 Places To Celebrate Oktoberfest 2016! Singapore is home to a multitude of religions and races and let’s be honest it seems we’re celebrating a holiday every other month! We’re days from ushering the new month of October and that means only one thing, Oktoberfest! We’ve sourced the top 10 places where you can celebrate Oktoberfest 2016, so get your body ready for the never ending flow of beers, Oomph music and way too much bratwurst! If you want to completely immerse yourself in Oktoberfest, you’re in luck because Oktoberfest Asia 2016 is going all out this year! Located at the open field at Tan Queen Lan Street, this large scale booze filled event is a dream come true for every Ocktoberfest fan! Each ticket purchased gets you free flow of beer from 6pm to 12.30am (!!!) and an Oktoberfest Asia beer stein for free! With beers like Schneider Weisse, Paulaner Brauhaus and Weihenstephan on tap. With Bavarian favourites available for purchase and live performances from Hofbrauhaus band. You’ll feel like you’re actually in Munich! Looking for a quiet place to celebrate Oktoberfest this year? Look no further, Cafe Swiss of the Swissotel The Stamford is having a dinner buffet from 1 Sept to 15 Oct! Featuring a Live Grilled Sausage Station and 5 handpicked meat teasers. You’ll be able to stuff yourself silly with copious amounts of meaty delights! Need something to wash down all that meat? Cafe Swiss is offering Erdinger Weissbier or Dunkel Beer at $16++ per bottle or $38++ for 3 bottles! Let’s be honest, Oktoberfest is all about the beers! And where else can you get the best beers in town than award-winning microbrewery Brewerkz?! Offering up their Signature Beers like Golden Ale and Pilsner alongside their Seasonal Beer?! Brewekrz also offers a wide range of Imported Beer & Cider, from Scottish BrewDog Dogma to Japanese Hitachino Nest Red Rice Ale you’re bound to find a beer that’ll tickle your fancy! Hungry? Brewekrz at Riverside Point is offering a Oktoberfest Set Meal ($35++) specially for Oktoberfest! Park Royal On Pickering has started their own Oktoberfeast early this year! From 19-30 Sept, the Lime Bar is offering unlimited servings of Erdinger Weissbier, Erdinger Weissbier Dunkel and Tiger Beer for only $68! Best part? If you head over in a group of 4, the Lime Bar will throw in a complimentary German platter full of German sausages and cold cuts! On 1 and 2 October 2016, Park Royal On Pickering will be holding a Bavarian Feast! Held at the outdoor terrace, you’ll be treated with free flowing Erdinger Beer and an assortment of traditional German cuisine! From German Sausages, Pork Knuckles and Chicken Schnitzel to Potato Rosti, there’s something for everyone at the Bavarian Feast! What’s better than getting a cold beer? Cold beer that COMES TO YOU! Erdinger is celebrating Oktoberfest by holding street beer gardens at Suntec City, Clarke Quay Central and The Star Vista! With a live German brass band, cold Erdinger on hand and the very unique Erdinger BARcycle you’ll definitely have a ball of fun! Best part? You get to sample foods from participating restaurants from Suntec City, Clarke Quay Central and The Star Vista. So if want a taste of Oktoberfeast without breaking the bank, you know where to head to! Just stepping into Paulaner Brauhaus will get you into the mood for Oktoberfest! Decorated to the nines, this part restaurant part microbrewery serves some authentic Bavarian cuisine! On 25 Sept, sit down to Paulaner Brauhaus’s specially crafted Oktoberfest menu! Served alongside live traditional and modern Bavarian tunes by Scharivari Sextett, Paulaner Brauhaus is the place to be if you’re looking to celebrate Ocktoberfest with a bang! With 5 outlets across the island, Brotzeit is the go-to restaurant to dig into some traditional German grub! This year Brotzeit is offering up the Oktoberfest Platter, enough for 6 or 4 hungry adults! This platter features a whole chicken, honey ribs, pork knuckles and snail sausages! Just the two of you? Opt for the Meter Sausage or the Whole Roasted Chicken! End your meal at Brotzeit with the sweet Rum and Raisin Pancake served with some plum sauce! If you’re looking to get a quick dinner with some friends or your partner, Brotzeit is the perfect place to head to! For one night only and for the the first time ever, Resort World Sentosa is holding its own Oktoberfest! Tuck into a buffet of German favourites like schnitzels, sauerkraut and four bratwursts specially created by RWS’s Michelin-Starred and Celebrity Chef Restaurants! Served alongside limited edition Erdingers and featuring a live performance by Ois Easy! Oktoberfest by Resort World Sentosa is definitely going to be ton of fun! Best part? They have Beer Pong! Tickets are priced at $78++ for the German fare buffet, the tasting platter of sausages and one glass of beer! Parties of 8 can get tickets at $750++ inclusive for two beer towers! By far the most popular place to celebrate Oktoberfest, Clarke Quay’s annual Oktoberfest just got bigger and better! Expect live Oompah music by Die Dorf Fest Kapelle as well as DJ NdA and DJ Luna spinning throughout the night! And what’s an Oktoberfest without traditional German cuisine? Up for offer at the Paulaner Clarke Quay food kiosk is a variety of German classic delights such as crispy Pork Knuckle drenched in wholesome homemade Beer Gravy! Wash down your hearty meal with Paulaner’s limited edition Oktoberfest Bier! Good news for those living in the north, you don’t have to go far to celebrate Oktoberfest this year! Orchid Country Club is throwing its own Oktoberfest party! If you’re all about having fun and competing in the spirit of fun, Orchid Country Club’s Oktoberfest is perfect for you! With sausage eating, arm wrestling competitions, log sawing and one minute challenges alongside live band performances OCC’s Oktoberfest is all about having fun! But don’t brush them off just yet, traditional German grub like pork knuckles, oven-based BBQ ribs and roasted lamb legs are all part of the menu! So there you have it! The top 10 places where you can celebrate Oktoberfest with a bang! Whether you’re going to spend the night, drinking and eating to your heart’s content or if you prefer a quiet get together with friends there’s bound to be a place that is perfect for you!